It feels as though we are competing. Our hearts race, our palms get sweaty, we hold our breath with every move. As Olympic athletes perform at world-class levels, we try to imagine the years of sacrifice, practice, and work. It’s hard to fathom. All who compete should feel tremendous pride, but a few achieve the ultimate dream–they win gold. Their stories move us; their joy overflows to us; their names leave a mark on our lives. 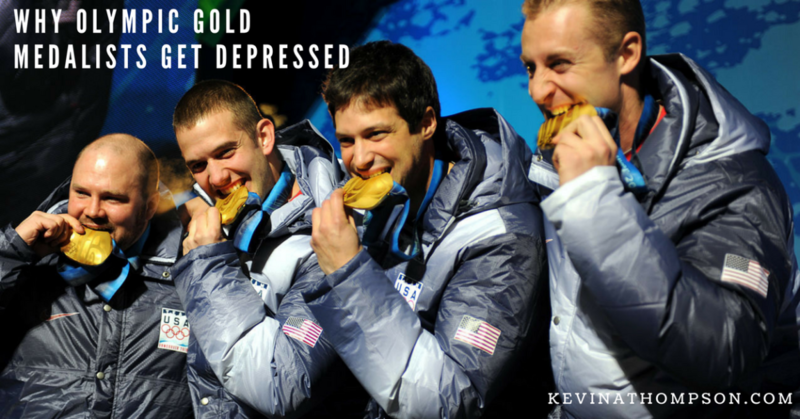 But there is a hidden sorrow for many Olympic athletes following success–depression. There is an unverified story about a Hall of Fame baseball player. Having played for years and never reaching the World Series, his team finally climbed the ultimate hill in one of his last seasons. After winning the championship in dramatic fashion, the team rushed the field. A lengthy celebration ensued. Returning to the clubhouse, interviews were given and a press conference was held. An hour after the final pitch, the player was sitting alone at his locker holding the World Series trophy and he was weeping. While I can’t imagine the levels of success many Olympic athletes experience–being the best in the world of their chosen sport, garnering international attention, and having years of sacrifice pay off as you perform at your highest level at just the right moment, there are several parallels we often share with these athletes. If we don’t avoid their wrong thinking, we will be set up for equal disappointment. 1. Defining themselves by what they achieve. When you are defined by what you do, you will be disappointed. Even if you achieve greatness, it will be fleeting. The Games will come and ago. Records will be replaced. Attention will go to the next generation. When we base our lives on our ability, job title, or success, we will greatly struggle when we fail or grow frail. We were created to pursue achievement, but we were never meant to be defined by what we do. 2. Believing success trumps relationships. Success requires sacrifice, but some things in life can’t be sacrificed if you want a life of meaning. Relationships must be prioritized. The connection between healthy relationships and emotional well-being cannot be denied. Far more than money, medals, or any other form of measurement, relationships influence our sense of value and worth. When we continually push relationships aside, we will pay a significant price. We should sacrifice success for relationships far more than sacrificing relationships in hopes of success. 3. Not understanding the value of pursuit. We were created for pursuit more than we were created for achievement. When athletes spend their whole life seeking a goal and suddenly the pursuit stops, they must replace it with something. Humanity is meant to continually seek something. When we stop challenging ourselves, learning new skills, and pursuing a goal, we open ourselves to struggle. Those who succeed after the Games are over are those who find a new area to give their attention and energy. While it’s doubtful that anyone reading this article will ever have to struggle with life after Olympic success, all of us face the seductions of achievement and the possible disillusionment if we do not understand how we were created. Accomplishment is an important part of human experience. Without it, we are not fulfilling our God-given design. Yet we must avoid the subtle temptation of elevating success and achievement beyond what they were created to be. Pursue, achieve, and succeed, but don’t do those at the expense of relationships or with the deception of believing they can give you a complete sense of worth or value.